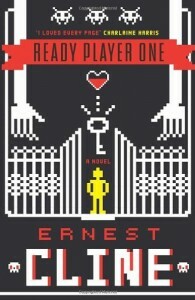 “Ready Player One” is the debut novel by Ernest Cline, while it isn’t a flawless work it is quite an impressive first book and a consistently entertaining read. The novel is set in 2040 in a dystopian America where decades of economic and environmental collapse have left most of the population, including the novel’s protagonist Wade, scratching out a meagre existence in the trailer park slums now dominating most of America’s cities. Wade is a geeky teenage who escapes from the horrors of his day-to-day existence using the same means as billions of others around the world, by logging in to OASIS, a virtual-reality online role playing game which has evolved into an immensely complex and detailed virtual world that has supplanted the Internet as the world’s primary means of communication and socialisation. Wade attends school online in the OASIS but spends most of his time in a quest to find an Easter Egg left by the game’s designer James Halliday. Five years earlier Halliday had died, leaving as his will a message that his vast fortune and control of the OASIS would pass to whoever managed to complete a quest he had left hidden in the game. There were few details about the quest, but Halliday had mentioned that solving the three puzzles necessary to find the Easter Egg would require a detailed knowledge of the computer games, RPGs, music and films that Halliday loved, mostly from the 1980s era when Halliday had himself been a teenager and had first began to realise the potential of computer games. As a result Wade, like millions of others on the quest, had spent much of the five years devouring every piece of media linked to in Halliday’s journals, from Dungeons and Dragons to Back To The Future, Monty Python’s Flying Circus to Pac Man. Wade quickly develops an obsessive nostalgic fondness for a time many decades before his birth which seems like an American Golden Age compared to his own time, and his knowledge will come in very useful when he comes up with a brainwave about what Halliday’s first clue means and where the first of the three keys he has to find is hidden. I thought this was a fairly good book; it was a lot of fun to read although it had too many flaws to be a truly great book. Some of the characterisation was a bit simplistic - particularly the clichéd Evil Corporation antagonists - the story was predictable and there were a few plot holes. Wade and his small group of friends are likable characters but they’re not particularly deep or morally complex characters and most of Wade’s characterisation is quite predictable given his basic biography, although he does have a reasonable amount of character development throughout the book, his initial obsession with the quest for the Easter Egg continues throughout the book but he does start to become aware that there are other things that matter other than winning the contest. Wade’s narration of the book is entertaining and witty (although some of his attempted witticisms are a bit clunky), but when there is actual dialogue between characters it does tend to be a bit simplistic - which is understandable given that the protagonist is a socially inept loner. I think James Halliday is potentially the most interesting piece of characterisation, although he never actually appears in the flesh in the book. The book does seem quite ambiguous in his attitude towards him, while he may have constructed a wonderful virtual world the novel does start to question whether he used his vast wealth responsibly and whether OASIS for all its positive attributes might also be causing harm. I think it could have spent a bit more time exploring Halliday’s ambiguous legacy, for example it doesn’t seem to spend much time considering the bleak implication of the novel that very little that is genuinely new has been created since OASIS began. I think the biggest problem with the plot was that the egg hunt didn't seem to be as hard as it was portrayed to be, particularly obtaining the first key - it may not have been easy (although the meaning of the "much to learn" clue was glaringly obvious), but it wasn't hard enough that millions of people would have spent five years failing to find it. In some ways parts of the quest might work better in a visual medium (apparently a film adaptation is being considered), since it is hard for a book to make compelling scenes where the protagonist spends hours playing 80s arcade games or re-enacts a classic film. There is some memorable imagery throughout the book, whether it is the bizarre sight of an undead sorcerer straight out of a Dungeons and Dragons campaign playing on an arcade game or the climatic battle between Wade and his friends and his corporate-funded rivals being fought between giant robots from various cartoon series. I think the setting was probably the best bit of the book, and the author did a good job of incorporating all the myriad references without having them get in the way of the plot too much, although arguably he could have spent more time explaining why the things being referenced were so great that they had such appeal decades later. While I am familiar with a lot of the 80s references in the books, there were a number of games referenced that I've heard of but never played and I therefore don't have any nostalgia about them, so it might have been a good idea for the book to explore exactly why people were so nostalgic about them that they would construct virtual tributes to them decades later, sometimes the nostalgia does seem a bit undiscerning. I don’t think it would be necessary to understand all the references to enjoy the book, although some familiarity with the things being referenced will probably make it more enjoyable. In summary, this is a fun adventure novel that perhaps doesn’t have a huge amount of depth but its gleeful virtual reconstruction of 1980s pop-culture makes it a very likable book.